Kraft Heinz pivots to plan B. What to do about Kraft-Heinz (NASDAQ:KHC)? One of Berkshire Hathaway's larger holdings (Berkshire owns roughly 26.7% of shares outstanding, controlling the company in tandem with Brazilian investment firm 3G Capital), Kraft's stock has tumbled roughly 28% in 2018, as the consumer packaged foods industry ("CPG") has come under pressure. In addition, the market is growing increasingly skeptical of Kraft's ability to make a transformative aquisition, which had been the main upside thesis in Kraft-Heinz ever since the two companies merged three years ago. Now near 52-week lows, is it time for holders to cut bait on the fallen darling, or is the stock now a screaming deal? I always like to get bad news out of the way first. Ironically, Kraft's bad news was recently articulated not by short-sellers or bearish sell-side analysts, but rather by its very own largest stakeholder! At a recent conference, 3G Capital CEO Jorge Paulo Lemann admitted, "I've been living in this cozy world of old brands and big volumes... We bought brands that we thought could last forever... You could just focus on being very efficient... All of a sudden we are being disrupted." Can innovatinve marketing like "Bacoin" save Kraft-Heinz? Image source: Kraft-Heinz. Lehmann founded 3G, and was instrumental in the acquisition-of-big-brands strategy behind Kraft-Heinz, AB InBev (NYSE: BUD) and Restaurant Brands (NYSE: QSR). For him to admit his company was "caught by surprise" after deploying billions of dollars toward the large consumer brand strategy was quite an admission. The disruption has come from the confluence of several factors, including the rise of craft/natural foods, low-cost private label brands, and the advent of e-commerce. The new generation of more health-conscious, yet budget-constrained consumers, has put traditional consumer packaged goods brands in a tough spot. On the high-end, these brands are being crowded out by healthier, more natural alternatives, while huge retailers have come out with high-quality private label brands, such as Costco's (NASDAQ: COST) Kirkland brand and Kroger's (NYSE: KR) Simple Truth, which are often priced below CPG rivals. These factors have challenged Kraft-Heinz's top-line, which fell 1.5% (in constant currency) in the first quarter. That being said, Lehmann also said, "I'm not going to lie down and go away," and Kraft's executives have been working hard to adapt to the times. Here are three reasons why you may want to buy the stock today. Currently, you are not only buying into a low-priced sector, you are arguably buying the best-run company of the lot, at a valuation on par with its industry peers, and receiving a 4.5% dividend as well. Of course, buying a cheap stock doesn't necessarily turn out well, unless management is on its way to improving. On that front, there are two ways in which Kraft-Heinz is attacking this new age of disruption. Kraft-Heinz isn't resting on its laurels, but is quickly innovating its products. These innovations fall primarily into two camps. One is around renovating "powerhouse" brands ($1 billion+ in sales) such as Kraft, Heinz, Oscar Mayer, Planters, and Philadelphia to make them more relevant (like taking out artificial ingredients from Kraft Mac 'n Cheese), and well as extending them to horizontal products (such as Kraft mayonnaise). The second type of innovation is for entirely new products. On that front, Kraft-Heinz is moving quickly, aiming for 60% more innovations in 2018 versus 2016. Recent successes include Devour frozen meals, as well as the new, "Just Crack an Egg," which, on the recent call with analysts, CEO Bernardo Hees said was "selling faster than we can make it." Kraft also recently started its Springboard platform, a start-up accelerator to find the next big food innovation. Management has emphasized the need to provide incremental sales, not just the replacement of declining or outdated products. Obviously, new brands such as these are not going to move the needle in the near-term -- new innovations only made up 7% of sales over the past three years. Still, there are hints at least some are making a difference. In its recent post-integration update, management credited the new Devour line with returning the company's frozen food category to growth after serval years of mid-teens declines. Behind all of this product innovation will also be a revamped marketing strategy. One of the more interesting things Kraft Heinz is doing is doubling down on its own salespeople inside supermarkets, rather than pulling back or using third-party merchandisers. By bringing everything in-house, the company believes it can be more effective, as well as use big data analytics to further target marketing campaigns to the modern age. Hees said, "We started doing this in 2017. I can guarantee you that it's paying off and we're actually doubling down on this." Kraft is also investing in its people, with employees completing 60,000 hours of custom-made courses just in the first quarter alone. These courses keep employees up to speed on the latest innovations in R&D, marketing, and industry knowledge. 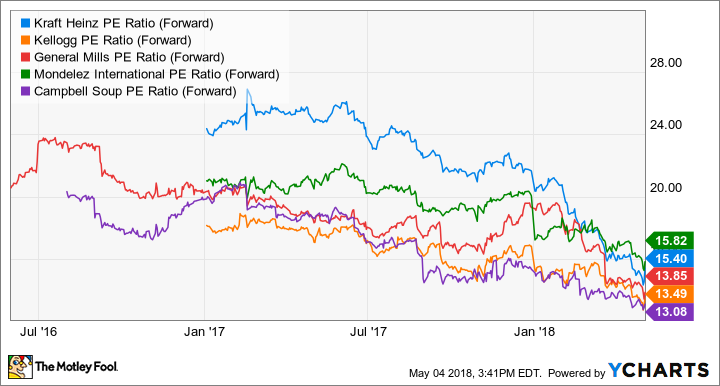 Down severely in 2018 while possessing the most dynamic management team in the industry, I'd be a buyer of Kraft-Heinz here here rather than a seller. It's time to be hungry when others are fearful!